If you’ve dabbled at all into the world of hacking an Android phone, you might have been quite put off by the dizzying array of terms and complicated instructions. Browsing a handful of tech sites, you might see words like kernel, ROM, root, superuser, flash, etc., with little or no explanation. Indeed, while the nice part of having an Android phone is the ability to mess with it quite a bit, it can be quite intimidating for the average user. And there’s always the looming threat of the dreaded “bricking.” More on that later. There are several guides and tutorial sites out there for how to root a phone, what software is out there to do so and then start modifying it, and the steps for using each. But this little guide will be more of an amateur user’s introduction to one such method—using RSD Lite for Motorola phones. We’ll go over what RSD Lite is exactly, why you might use it, and some concepts to understand when delving into this exciting territory. One quick thing, hacking your Android device can void its warranty, lose your data, and otherwise ruin your phone if you’re not careful, so do take caution. This is a good starting point, but don’t go in swinging. Read up. RSD Lite stands for Remote Software Download, and it’s Motorola’s tool to install software or code onto an Android device. It’s an application you can download for free from several places, right here on our RSD Lite download page among them, and is a necessary tool to root a Motorola device powered by Android. Think of it as a program to help you program your phone. Ok, first we’ve going to have to back up a bit and explain a few things. Let’s get real basic here for a second. Most non-Apple mobile devices are powered by Android, an operating system that is backed by Google and developed using open source code, meaning anyone can grab it and alter it for their own use. Just like your computer might use Windows, your phone might use Android. But not all Android phones are the same, because manufacturers like Motorola will alter the code themselves to customize it as they see fit, and add stuff on. These additions are often called “bloatware” because they tend to be pretty useless and slow the device down. You can alter an Android operating system to some extent, more so than the Apple OS, but not entirely, since manufacturers don’t really want you messing with the program that they tailored specifically for your phone. If you want to buck the system’s controls and gain entire access to your phone’s system, you’ll want to “root” your phone. Rooting means you give yourself full administrative access to the coding that underlies how your phone works. Why would you want to root your phone? Well, probably one of the most common reasons is hacking away bloatware. You can get rid of clunky software you don’t want, keep what you do, and speed up your phone in the process. You can also root your phone to manually upgrade to new versions of Android. Or, remember how manufacturers mess with Android to customize it for their phones? Well, so do other people, third parties. The result is a bunch of so-called Custom ROMs, or modified operating systems that are pushing the envelope on what Android can do. When you root your phone, you can install these. Finally, maybe you don’t want to completely overhaul your system, but there are a number of applications that you can only install if you have root access. Ok, so we’ve covered some of the basics, but there are still about a million techy terms people use with this stuff. So we’re going to take a minute to define them. Rooting – unlocking administrator access to your device’s system. This is comparable to “jailbreaking” an Apple product. When you root an Android device you become a “super user” meaning you can make changes to the underlying programming or firmware. Bootloader – This describes lines of code that run before your operating system starts up, and is unique for every device. You’ll need to unlock the bootloader to change your underlying systems. Custom ROM - A ROM is the firmware, or underlying program that operates your phone. If your manufacturer has a customized version of Android, that’s your ROM. A custom ROM is a fancy, homemade ROM that a savvy programmer has made to improve the standard systems. Custom Recovery – This is software that you use to modify the phone’s underlying software or to add a custom ROM. One popular version of this is ClockworkMod Recovery. Flashing – This is when your Custom Recovery or another program like RSD Lite installs software or code onto your phone’s underlying system. It just means “install,” but on a deeper level that requires a program outside of your operating system. Bricking – When you reduce your expensive piece of hardware to not much more than a brick. This is the ultimate danger in hacking your Android, and basically means you’ve rendered your phone useless. Depending on your phone’s model and operating system, take special care to follow tutorials closely and follow all of the steps correctly to avoid bricking your phone. What does RSD Lite do and where do I get it? RSD Lite is used in the very beginning steps of this process. The main thing it does is “root” your phone. You’ll connect download and run RSD Lite on your PC, connect your Android device with a USB cable, and follow a very specific set of steps that, when completed, will reboot your phone with you as a super user with administrative access. 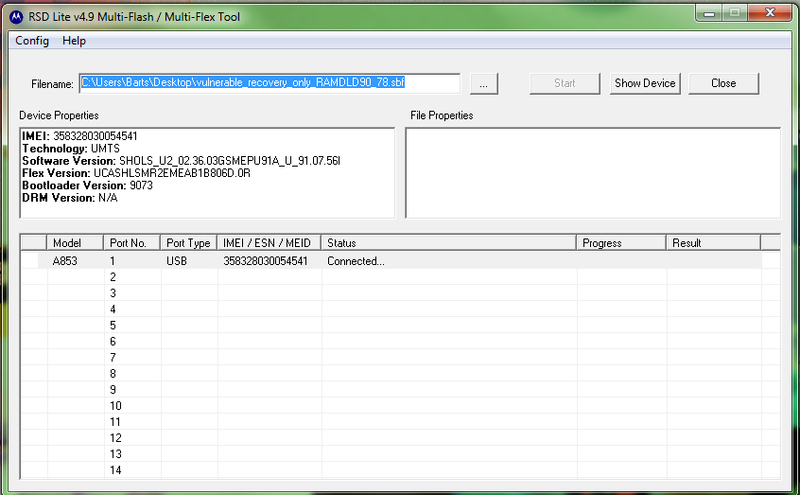 From there, you can flash a custom recovery or various other programs onto your Motorola device. One very valuable place to find downloads of RSD Lite’s latest versions, and other general advice is xda-developers. How do I use RSD Lite. I have the SBF file and need to unroot? Thanks. Which version do you work best with?